Why do I need time stamp? The time stamp is a very useful tool. Some of its uses are to: record the date and time of an incident for future reference, help locate sections of a recording if it is particularly long, verify when the footage was taken. It can be used as a business tool to monitor the date and time of customers visits by employees. Choose one of many Laser cameras with Time Stamp feature today. What is the difference between batteries? The latest development with Lithium-Ion (LI) battery technology has been the introduction of the Lithium Polymer based battery. Not only does the Lithium Polymer battery last longer, the battery is no longer limited to traditional battery cylindrical shapes. The battery can now be molded into a customized shape to fit inside any product making it the choice for manufacturers developing the latest slimline and stylish devices. For best results and like with all other batteries, LI batteries should always have top up charges if put in storage for extended periods of time. Can Crash Cam be used as a legal eye witness? Crash Cam footage and any video footage such as those from security cameras or simple photos taken by smart phones are regularly used as evidence during legal proceedings. These critical pieces of evidence regularly help to collaborate accounts and can effectively been seen as another eye witness account. Invest in a Navig8r Crash Cam today to be your eye witness partner. How much difference is there between 720p and 1080p? These are used to describe picture resolution show the number of vertical lines. In the case of 720p, 720 lines are displayed. In the case of 1080p, 1080 lines are displayed on the screen which is probably the most common resolution on TVs today. 1080p is higher in resolution and will display a noticeably better picture. Should I buy a SD card with the biggest memory so I can record more? For most cameras, you want the biggest capacity SD card so you can record more. However it is not a critical requirement for crash cameras as they cycle record and continually recycle space on an existing card. The need to purchase a larger card would come down more to the cost differential between sizes and any possible second use you may have for the card when not in use for example as a camera card or as memory for another portable device. 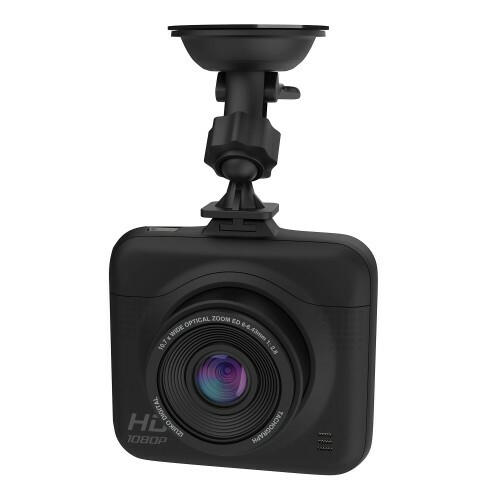 Essential for the everyday driver, the Navig8r Crash Cam FHD records in full high definition and is loaded with exceptional features. It is great value for money offering everything you need to record footage on the road, whether in daylight or at night. Full high definition 1080p video quality provides better image clarity than HD 720p. Capture up to 3 lanes of traffic with this extra wide angle lens. Easily playback content on the large size colour screen and conveniently view all vital information displayed on screen. Recording will start as soon as it senses movement in front of your vehicle.